When you first turn on your computer, most people have no idea about the processes that are running, just to start your computer. there is built in software on your motherboard, commonly known as the BIOS, Basic input operating system. The BIOS will run a power on self test (POST), which will first determine if the hardware components are sufficient to run the computer. Then it will move on down the line. This article will explain, hopefully in non technical terms, about MBR error messages and why we might see them. What is an MBR Error? MBR error messages show up when the BIOS cannot read the MBR due to the layout being damaged or corrupt. Below is an example of a MBR. A load of mumbo jumbo to the normal eye, but this is the sequence that helps start your computer. 000000050   96 8A 46 04 B4 06 3C 0E  74 11 B4 0B 3C 0C 74 05   –SF.?.<.t.?.<.t. 0000001B0   00 00 00 00 00 00 00 00  A6 34 1F BA 00 00 80 01   ........¦4.?..€. If some of this code is not the way the BIOS expected then an error message will appear and your computer startup process will not continue. Why Does A MBR Error Occur? One of the pieces of hardware that the BIOS will check is the hard drive. It will search for the master boot record (MBR), which is a small piece of software that is required to load the OS during the startup process. If the BIOS has problems with reading the data on the master boot record, you will most likely see an error message. You might have a Windows operating system stored on your hard drive, but Windows will not start if the BIOS cannot read the master boot record to tell it what to do next. The boot sector is the first part of the hard drive reserved for the MBR and associated files. The first 446 (0x1BE) bytes are MBR itself, the next 64 bytes are the Partition Table, the last two bytes in the sector are a signature word for the sector and are always 0x55AA. The Bios is looking for a signature at the very end of the 512-byte sector, and then it just transfers control to the initial bootloader situated in the first 446 bytes of the boot sector. The criteria for a valid bootable device is the presence of a bootable partition in the partition table and some other possible checks. This is because some most modern BIOSes will also look for some kind of partition table, while others do not check for this. What Causes MBR Error Messages? A missing signature that will transfer control to the boot loader. A damaged or corrupt boot loader. A hardware error. The harddrive might be dead and therefore the MBR can’t be accessed. An MBR error can be caused by unexpected shut down of a computer, corrupted files, virus attacks, and more. This error message is letting us know that the partition table is damaged or missing. This could mean you have another usb drive plugged in or the boot order in your BIOS has changed to something other than your main hard drive. It can also mean that you need a repair job done. Boot into your Windows 7 install dvd. Select “Repair my computer” and “Open a command prompt”. Type bootsect /nt60 c: /mbr /force, assuming c: is the boot volume. See below for Windows XP. I guess this one is obvious also. No operating system found. Well the operating system is either corrupted or the Bios could not read the MBR to see which partition the OS is on. Either way Windows repair should fix this problem. I have seen this error when I did not have a hard drive plugged in at all or not plugged in correctly. It can also mean that some other device is plugged in and the computer is trying to boot to that which is not a system disk. There is a media Direct button just to the left of the on off button on dells XPS computers which changes the partition table if pressed. The NTLDR is missing error message is for Windows XP. For example Windows NT Loader (NTLDR) was used instead of Windows Boot Manager (Bootmgr.exe) which is used for Windows seven. 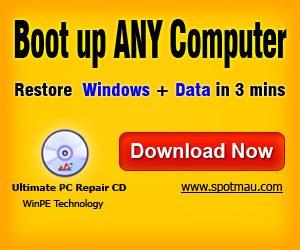 If your PC cannot enter Windows, or your Windows has problems, this CD can help! If the MBR error has occurred due to a hardware failure, then I would not recommend trying to fix a hard drive. It is best to replace the harddrive and hopefully restore the information from a recent backup. There are many ways to backup your data but the Windows backup utility is one you should definitely be using. If the MBR is corrupt or damaged it can easily be repaired. Using your operating system disc and the repair options available will probably always repair the MBR for you. That is of course if you type the right commands into the recovery console.